December 23rd, 2014, Charlottetown – Speed Skate PEI has named eight short-track speed skaters to the Island’s 2015 Canada Winter Games team. The team, consisting of five male and three female skaters, will compete in Prince George during week one, from February 15 to February 20. 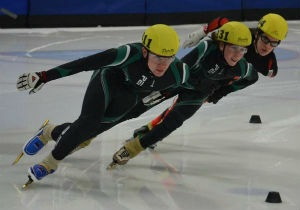 Zach Moran (left) and Peter McQuaid (centre) are among eight athletes who will represent P.E.I. in short-track speed skating at the 2015 Canada Winter Games in Prince George. Photo courtesy of Duncan McSporran. The selected skaters will each participate in four individual events, including the 500 metre, 1000m and 1500m distances. The 3000m points race event has also been added to the Canada Games for 2015. In addition, P.E.I. will have a male team entry in the 3000m relay, where it hopes to match or better the 6th place finish of the 2007 team. For athlete profiles and photos, visit www.speedskatepei.com/canada-games.